Figure 9.6. Puromycin (left) as an analog of aminoscylated 3'-terminal adenisine of aminoacyl-tRNA (right). In this way the peptide becomes transferred not to the aminoacyl-tRNA, but to a low-molecular-mass compound which is not retained in the ribosome; as a result, the peptidyl puromycin is released from the ribosome. Thus puromycin leads to the abortion of the growing peptide. The use of puromycin has played an important part in studies on the ribosomal peptidyl transferase center (PTC). Its use has made possible the identification of the ribosomal subunit that bears PTC. The isolated large subunit can retain peptidyl-tRNA, as well as show some labile interaction with the 3'-terminal fragments of the N-blocked aminoacyl-tRNA, which serve as donor substrates. The peptidyl transferase reaction occurs when puromycin is added to the large subunits carrying peptidyl-tRNA or its analogs. Hence, it can be concluded that PTC is located entirely on the 50S subunit or the 60S subunit (Monro, 1967). The small (30S or 40S) ribosomal subunit does not contribute to the catalysis of the reaction at all. Neither product is retained by the 50S subunit, and both of them are immediately released into solution, again being typical of normal enzymatic reaction. During transpeptidation as a step of the elongation cycle PTC binds the 3'-terminal adenosine with aminoacyl residue of the A site-bound tRNA at the a site, and the 3'-terminal CCA sequence with aminoacyl residue and its peptide group of the P site-bound tRNA at the d site. In this case, however, the products of the reaction cannot be released into solutuon, but retained by the ribosome. Naturally, there have been many attempts at isolating the "enzyme" from the 50S or 60S subunit, i.e. 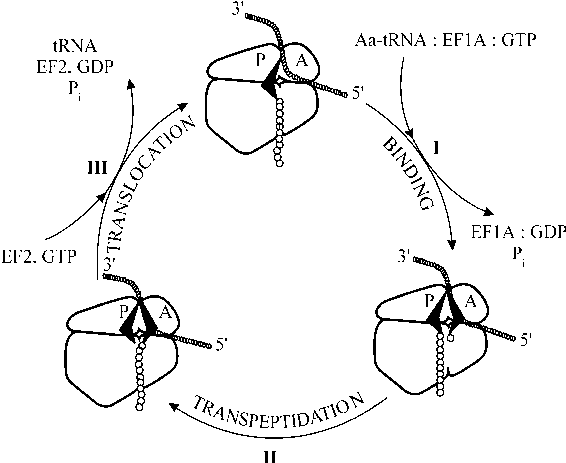 at finding the ribosomal protein responsible for catalyzing transpeptidation. However, none of these attempts have proved to be successful; the isolated proteins have not showed the presence of such activity. It was concluded that the "enzyme" may consists of several proteins tightly integrated in the 50S ribosomal subunit and that it undergoes disruption in the course of protein isolation. Various analogs of peptidyl-tRNA and aminoacyl-tRNA which carry a chemically active or photoactivable group on the aminoacyl residue at the 3'-end of tRNA have been used as affinity labels for identifying proteins located in the region of PTC (see, e.g., Barta et al., 1990; Cooperman et al., 1990; Wower et al., 1989). Most intense crosslinks have been observed in such experiments with protein L27 and, to a lesser extent, L2 and L16; proteins L6, L11, L14, L15, L18, L23 and L33 have also been reported as crosslinkable neighbors of the substrates of PTC. In experiments on the partial disassembly and reconstitution of 50S ribosomal subunits, proteins L2, L3, L4, L6, L11, L15 and L16 have been found to be essential for peptidyl transferase activity. However, none of the proteins listed has proven to be indispensible for the activity. At the same time, experiments on the affinity labeling of PTC by active aminoacyl-tRNA or peptidyl-tRNA analogs repeatedly demonstrated that although proteins were frequently found as crosslinkable neighbors of these analogs, the ribosomal 23S RNA was still the preferred target. Most of the crosslinks were concentrated in domain V of the 23S RNA (see Fig. 6.5 B), that forms the upper part (the "neck" surroundings, see Figs. 5.8 and 5.9) of the 50S subunit body. Crosslinking of the photoactivated label-carrying acceptor end of tRNA with position 2584 of the bacterial 23S RNA, as well as nucleotide replacements at positions equivalent to 2447-2504 in the 23S RNA accompanying the mutations of PTC, suggested that PTC is located in the region of the evolutionarily conservative sequence 2450-2600 of domain V.
The use of the foot-printing technique to determine the residues protected by acceptor ends of the two substrate tRNAs (Noller et al., 1990) has demonstrated that the protection sites are mainly within the same sequence, specifically A2439, A2451, U2506, G2553, Y2555, U2584, U2585, A2602, U2609 and some others. A classical inhibitor of the bacterial PTC on the ribosome, chloramphenicol, protects positions A2059, A2062, A2451, and G2505, located nearby or in the same region. This region, called "PTC ring" (Fig. 9.7), is the junction of five helices. It is interesting that this region is especially enriched with modified nucleotide residues. Figure 9.7. 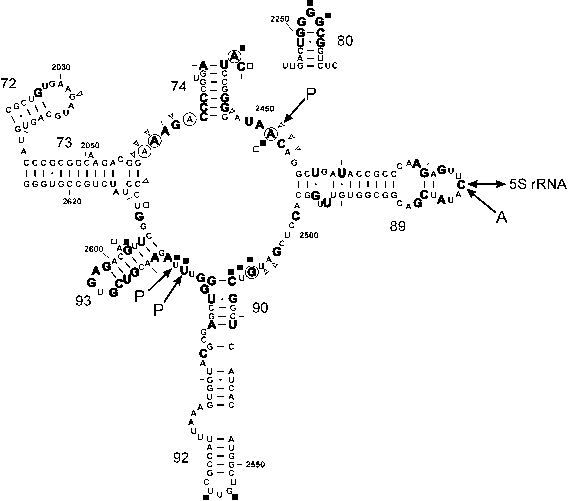 Peptidyl transferase region ("PTC ring" and adjacent hairpins) of domain V of the E. coli 23S rRNA (see also Fig. 6.5). Nucleotides indicated by bold letters reflect 100% conservation in evolution. Nucleotides protected by antibiotics against chemical modification are encircled. Open arrowheads point to nucleotides methylation or mutation of which confer resistance to antibiotics (R. A. Garrett & C. Rodriguez-Fonesca, C., in Ribosomal RNA: Structure, Evolution, Processing and Function in Protein Biosynthesis, R. A. Zimmermann & A. E. Dahlberg, eds., CRC Press, Boca Raton, p.p. 327-355, 1996). Footprint sites from tRNA at the P site (d site of PTC) are indicated by filled squares, and those from tRNA at the A site (a site of PTC) are indicated by open squares (D. Moazed & H. F. Noller, Cell 57: 585-697, 1989). Cross-linking sites from tRNA at the P site (P) and at the A site (A), and from 5S rRNA are shown by arrows (M. Osswald, T. Doering, & R. Brimacombe, Nucleic Acid Res. 23: 4635-4641, 1995; O. A. Dontsova, V. Tishkov, S. Dokudovskaya, A. Bogdanov, T. Doering, J. Rinke-Appel, S. Thamm, B. Greuer & R. Brimacombe, Proc Natl. Acad. Sci. USA, 91, 4125-4129, 1994).